Some of you might recognice this window. 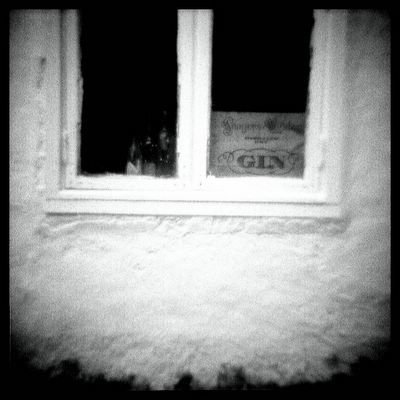 It`s one of our cellar-windows at the cabin, where we spend most of our time when we`re off work. I went through some old stuff I`ve collected during the winter, and photographed some of it. Like these bottles, and the old empty box. The camera I used is a Diana copy. It`s probably from the mid-sixties. It has a fixed shutter, and an "adjustable" plasic lens. It has some major lightleaks, and I usually use a lot of tape to make it light-tight, but this time I didn`t bother - I wanted to see how bad it could get. The lightleaks made the negative look like it was cut in half. One side was ok, the other side was way too light. Looks like I have to use some tape after all. My Hasselblad is starting to collect dust, and I guess it`s time to start using it again. I`ve said it before - my choice of camera does something to my creativity. I play a lot more with cheap junk than with "real cameras". I need to work with that.